The Point Lookout water trails are located at Point Lookout State Park - the southernmost tip of St. Mary’s County where the Potomac River meets the Chesapeake Bay. The State Park offers a variety of paddling experiences that range from an hour or two to all-day excursions with overnight camping options. In addition to the water trail routes, the water trail map/guide also provides information on special features and points of interest on the Point Lookout peninsula. 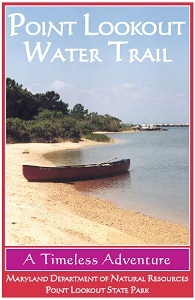 Originally printed in 2003 and reprinted in 2007, the guide features over 7 miles of water trails along three different routes in and around the Park. The map is printed on waterproof, tear-proof paper.